The CDSB Climate Change Reporting Framework is a voluntary reporting framework designed to elicit climate change-related information of value to investors in mainstream financial reports. Created in line with the objectives of financial reporting and rules on non-financial reporting, the Climate Change Reporting Framework seeks to filter out what is required to understand how climate change affects a company’s financial performance and value creation. Information prepared in accordance with the Climate Change Reporting Framework enables investors to make informed and robust decisions. These are based on clarity, confidence and trust in climate-change related opportunities and risks disclosed by a company, understanding their comparative position with respect to future challenges and opportunities. Why should my company use CDSB's Framework to do this? 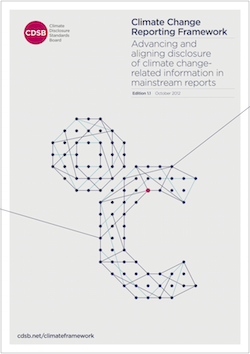 Companies can use the Climate Change Reporting Framework to incorporate climate change-related information in mainstream financial reports. The Framework’s content assists companies in achieving a holistic view of how climate change can affect their performance and the necessary actions they could take to address the risks and opportunities. Governments can benefit from a standards ready framework that can be immediately adopted or referenced as a method of compliance in regulation/guidance, allowing businesses to contribute to national greenhouse gas reduction targets. Investors will be able to make informed and robust decisions based on clarity, confidence and trust in climate change-related opportunities and risks disclosed by a company, understanding the comparative position of companies’ with respect to future challenges. Analysts will be better equipped to utilize climate change-related information in determining impacts on future cash flow and ultimately company valuations. The guide to the Framework sets out the essential elements of the Framework, alongside illustrative examples drawn from reporters of different size and from a variety of sectors. 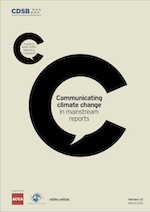 It is intended for use by company personnel involved in compiling and delivering climate change reports for corporate investors.